Between the Real and Utopia is an exhibition centering performance practices that investigates the process of “getting there.” The position of being between two temporalities–the real and a utopia–indicates a notion of flux, and on favorable occasion, progression. 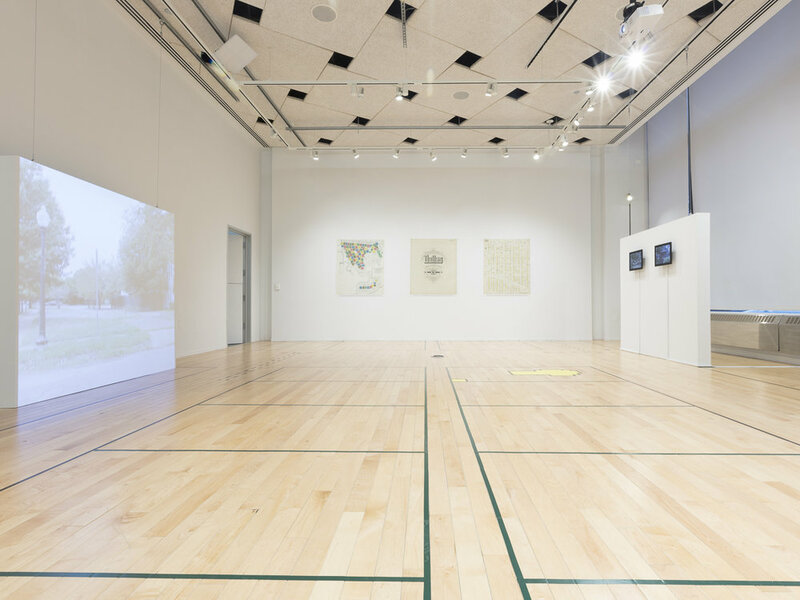 Perpetually marked by temporality, performance practices glimpse how new ways of seeing, being, and doing are enacted, making them a suitable metaphor for what characterizes the in between. Though a group show, the exhibition format cycles through a series of smaller artist projects–individual and collaborative–conjoining the temporally-bound nature of performance with a curatorial platform that performs in tandem with the artists. Each iterative project occurs over a week, staging performances, programs, and activations in conjunction with its installation, pointing to the potentialities of utopia's reverberation back into the real. Press: KT Hawbaker, “A Special View of Utopia,” Chicago Tribune December 7, 2017. Rather than simply accounting for the artists included in this exhibition, the curatorial statement for Between the Real and Utopia swings a bit differently. It contains a latent performativity of its own, signaling my own itching state of anticipation. This is a position of in betweenness, as I find myself straddling knowing–the artists, their practices, their plans–and not–what happens in embodiment, how will these projects pass through each other, and what will be left behind? The exhibition stemmed from a conjoined interest in the conditions of performance practices in traditional gallery space, and attempting to envision useful ways to strategically move through the emergent precarity endemic to global politics, which an incredibly smart artist described to me as ‘groundlessness’. This metaphor taken further forms the contours of the exhibition. 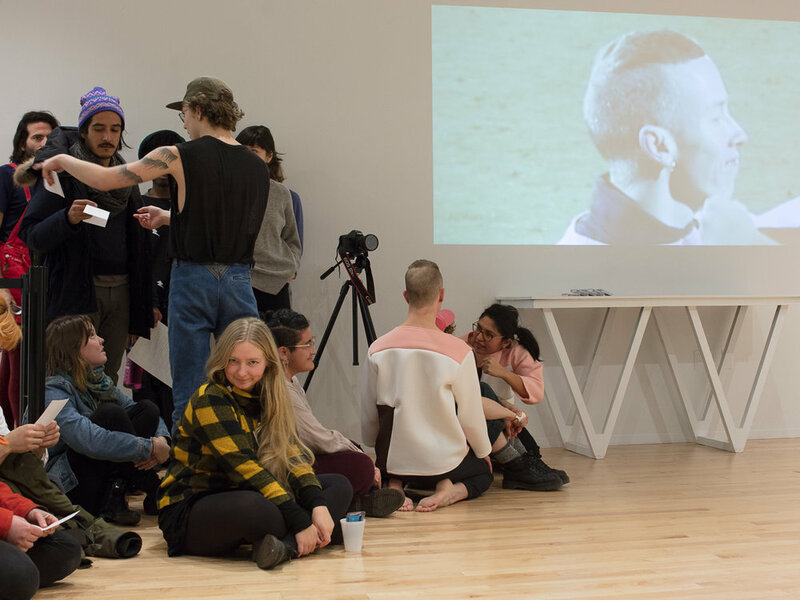 Though a group show, its format cycles through a series of smaller artist projects–individual and collaborative–conjoining the temporally-bound nature of performance with a curatorial platform that performs in tandem with the artists. Each iterative project occurs over a week, staging performances, programs, and activations in conjunction with its installation. As the show’s format was rethought and critically-engaged by the artists, it became clear to me that the operation of the show’s flexibility is eerily synonymous with capitalism’s ever expanding scope–a constant adaptive capacity for sinking into new cultural contexts and economies. However, any pitfall or assumed weakness, ingested then spit back out, can be responsively leveraged as point from which to critique or flex. Even the most infectious theoretical frameworks must acknowledge a certain methodological closeness to that which they seek to contest–a critical and reparative mimesis. Between the Real and Utopia takes neoliberalism and late capitalism’s values of choice, flexibility/adaptability, productivity, and capital exchange as material to be played with, though that is not its entire focus. What are the potentials of being on flexible ground or groundlessness, and what are a handful of formations that can be erected to glimpse the then and there, the not-yet-conscious possibilities which are dimmed by the real? The exhibition has a preoccupation with structures–those that on the surface we know to be harmful and exclusionary, and others which interpellate us through their subtlety. Presented here in order of their unfolding during the show, the artists included point to the gaps within the structures in question. Mev Luna engages with the formal qualities of gentrification–erosion, obfuscation, embodiment and the lack of–in order to point to content that's lost, and that which leaves a residue. The sedimentation of those traces occurring when a place transforms from serving one public to another via a capitalist impulse, is where Luna locates the conflation between gentrification, displacement, cultural assimilation, and familial transformation through generational extension and migration. Marcela Torres thinks past visuality to question what happens when the body's sensorium is pushed to add weight elsewhere–what does difference sound like through a bodily register? Torres points to what affects are accessible or inaccessible via marginality in the U.S., seeking new ways of forming attachments between bodies that destabilize how identities are construed, and subsequently confined. Michael Pusey opens up the mental, physical, and emotional effects of living in poverty while simultaneously seeking community. Amassing both material and sonic archives, he contends with the bodily responses to being weighted by capitalism’s woes while also being deeply attuned to the intersectional concerns of developing intentional spaces for care and transformation. Michelle Murphy takes on the codified archetype of the space explorer–cis, white, heterosexual, and male–by both revising and proposing new histories. Seeing outer-space as a frontier to enact new possibilities of the human, she points to who has been left out or denied entry to its potential. The complexities of labor (physical, emotional, maternal, etc. ), bodily representation, and public intimacy are brought to light as much as they are reconstituted. The exhibition concludes with ⊖ (“Circled Minus”), a para-residency program lead by co-directors Willy Smart and Misael Soto, who exaggerate the management of artistic productivity and its subsequent legibility to audiences. Literally using bureaucracy as a medium, ⊖ presents a packed program calendar that self-reflexively obfuscates its promotion of indulgent hot air. Their installation challenges art institutional structures by pushing the audience to be more aware of how they are interpellated into productivity, even if it is a liberally-minded and culturally situated form of production. Between the Real and Utopia presents a series of glimpses envisioning the possible, which funnily enough, are impossible to see all at once due to the exhibition’s own performative state. 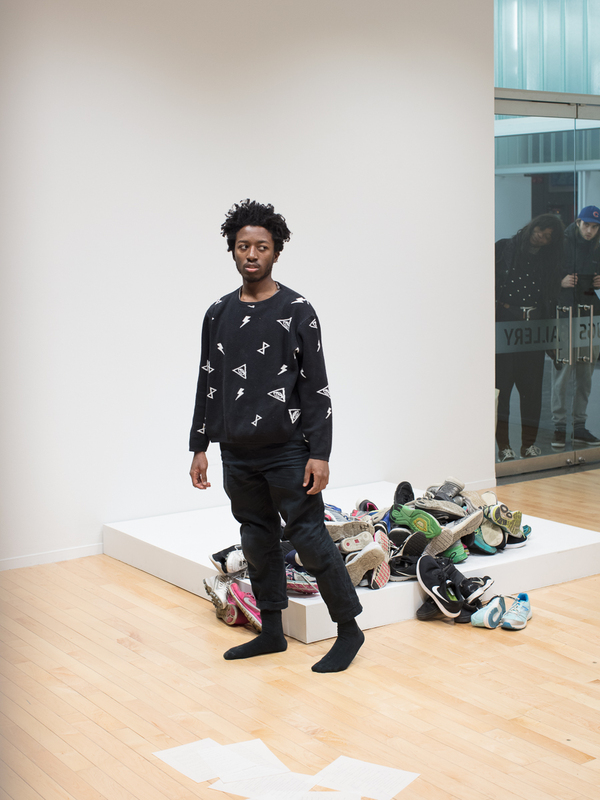 It’s meant to test the strictures of the exhibition format while also pointing to what typically falls off the wagon in larger conversations concerning societal structures. I hope you, the viewer, the reader, the participant, find some agency in the feelings of being in between.